I hope that all of you had a great mid-winter break. I hung around town getting the budget prepared for our first presentation next week, but there were also plenty of school functions to attend. Swimmer Collin Zapisek won two Section III Championships just as break began. He won the 200 freestyle setting a pool record and also won the 500 freestyle. In Track we qualified two girls for States during the State Qualifiers: Abby Uczen won the pole vault event; Laura Leff finished 2nd in the 1500m (first two advance to States). The boys 4x800 relay (which consisted of Sean Beney, Nathan Conroy, Jack Erhard and Kal Strickland) missed the State cut by two seconds (only one team goes to States) but qualified for the National Championship in the Emerging Elite division on Friday, March 14. We also have two varsity 8th graders (Carly Benson and Rachael Whiting) that qualified for the National 7th/8th Grade Mile on Sunday, March 16. The Boys Basketball team lost in the sectional quarterfinals to kick off the first weekend of break. I have a son on the team so I was disappointed as you might imagine. The Girls Basketball team won their game and then went on to win the sectional semi-final this past weekend. 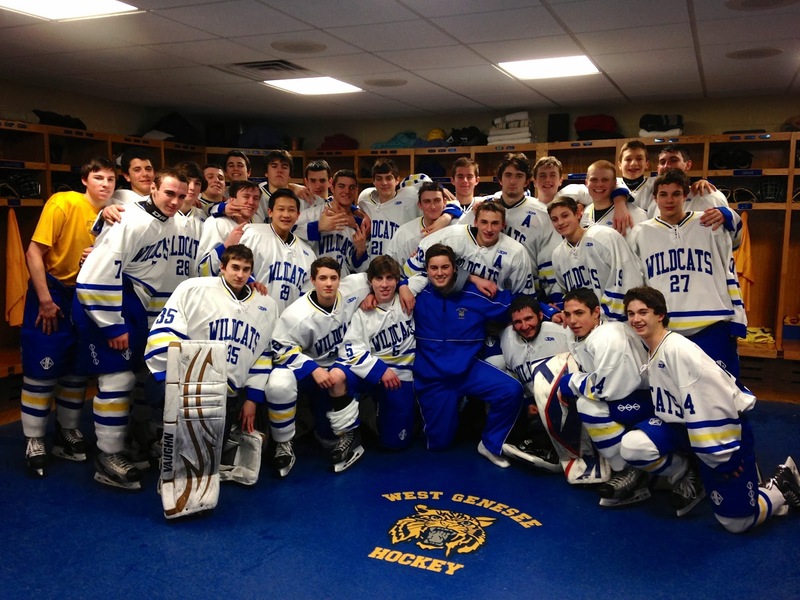 The Boys Hockey team won sectionals for the seventh straight year as well. The Girls Basketball team will play for the sectional championship at the Carrier Dome on Friday, February 28 at 8:45 p.m. against CNS. The Boys Hockey team will enter the first round of state championship play on Saturday, March 1 at home versus Fairport starting at 7:30 p.m..
Collin Zapisek will swim in the NYS Championship on Friday, February 28 and Saturday, March 1 in Rochester. Abby Uczen and Laura Leff will compete in the NYS Championships on Saturday, March 1 at Cornell. Needless to say that I did not mind not going away. Between the student events and the warmer weather that we had my "stay-cation" was quite alright! Congratulations to all! Rally for Education Funding: During the week it was also determined that the education rally that was going to be held at CNS, but had to be canceled due to weather, will be held at West Genesee on March 12. It will begin at 6:30 p.m. and we are encouraging people to attend this informative session about how we can do a better job of lobbying for education funding. Why is this important? While creating the budget last week we calculated that we will need at LEAST $860,000 in additional school funding or we will have to make reductions in that amount which would certainly be course altering. This $860,000 could easily be achieved if the governor restores a portion of our "Gap Elimination Adjustment". Restoration of this "GEA" is important whether you are for or against the common core learning standards. Restoration of the "GEA" is important for those who still believe in public education. I will have more to share later in the week, but I wanted to welcome you back and help get you in the swing of things with this quick note. National Letter of Intent Signing: This week sure has been busy! Earlier in the week we held our first ever National Letter of Intent Signing Day. Eight of our athletes who will be attending Division I or II colleges and universities met in the high school library to ceremoniously "sign" their intention letters. Mike Burns, our Athletic Director, did a wonderful job focusing on the academic goals of the student athletes as well as how their athletic accomplishments helped to open doors for them. Some interesting statistics were provided. First, the cumulative current grade point average of the athletes is 91%. Not shabby at all. Secondly, if each of the athletes stays in school for the next four years, they will receive scholarship money in excess of $1.6M. Congratulations to our student athletes and their families! Veteran's Tax Exemption Update: At our Board of Education meeting, the Board decided that AT THIS TIME they are not going to approve the "Veteran's Tax Exemption" that all schools in New York State have the ability to adopt. 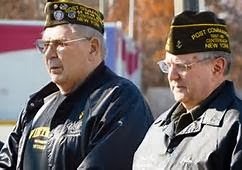 Their decision has everything to do with a lack of information and NOTHING to do with wanting to disrespect the 1,688 veterans living in our District. The potential tax impact on non-veterans "could" reach $70 per $100,000 assessed value on top of the regular yearly impact of the school budget, which has been between $11 and $14 per $100,000 of assessed value since I have been the superintendent. I emphasized the word could because Onondaga county currently lacks the software to provide exact values and impact. Once the county is able to provide our Board with accurate information, the Board will revisit the topic. Glitch in Communication Service: Our school news notifier service, "SNN", is not working properly and it is very irritating. This morning we had a two-hour delay and my normal notification stream is to put the notification on my Twitter account, then send staff an e-mail, continue with an update through SNN, Facebook, Parentlink phone app, the website, and then to the television and radio. This whole process takes about four to six minutes. Our community has come to rely on my Twitter feed and our SNN service more than the other communication methods, and the SNN service has lagged behind miserably lately. If the company that provides the service cannot correct this, we will be shopping for a new service. Thank you for your patience. Going forward, if the day looks to be challenging when you wake up, please check out other notification methods, as well as SNN, until we can get this issue resolved. Upcoming Events: There are a lot of sectional and state events coming up beginning tonight right through the end of break week. Our website will have the most up-to-date schedule. Enjoy the break and I will write again at the end of next week. This is just a quick post to let you know that the Board of Regents has been meeting regarding the implementation of the Common Core Learning Standards [CCLS] in New York State. They will be acting on recommendations tomorrow that will change how the CCLS are being implemented. These recommendations are beneficial for administrators, teachers, and most importantly STUDENTS. I also expect there to be other changes made in the coming weeks, so stay tuned. A summary of the changes that will be voted on tomorrow is below (and were copied and pasted from verified websites). We are speaking and they are listening. Not quite there yet, but we are on the move. 1. Periodically Review and Update the Common Core Learning Standards. Advocate for the National Governors Association and the Council of Chief State School Officers to convene states periodically to review and update – as appropriate – the Common Core standards. The review should include each state, including New York, gathering feedback from stakeholders including educators, higher education faculty, business leaders, parents, special education advocates, and bilingual education experts. 3. Give high school students more time to meet the Common Core standards. Extend the phase-in for Common Core-aligned Regents examinations required for graduation so that the class of 2022 is the first that is required to pass English and mathematics Regents exams at college and career ready levels. In addition, provide flexibility with respect to the Regents Geometry Exam by allowing, similar to the flexibility offered at local discretion for the current school year in Algebra, the higher score to count for students who take the 2005 standards Geometry exam in addition to the Common Core-aligned Geometry exam through the January 2016 administration. Student performance will continue to be reported on a 0-100 scale. 4. Eliminate high stakes for students. Issue guidance indicating that (1) the Department neither requires nor encourages districts to make promotion or placement decisions using student performance on state assessments in grades 3-8; and (2) if districts choose to consider state assessments in grades 3-8 when making promotion or placement decisions, they should make adjustments to ensure students are not negatively impacted by the Common Core transition and should use multiple measures - not grades 3-8 state assessment results alone. 5. Reduce field testing and provide increased access to test questions. Advocate for the Governor and state legislature to adopt the Regents state budget priority request for $8.4 million in new funding to eliminate multiple-choice stand-alone field testing and to allow the Department to print more versions of state tests so that more test questions may be released to teachers and parents. 6. Offer smarter testing options for students with disabilities. Advocate for a federal ESEA waiver from the United States Education Department (USED) to allow students with severe disabilities who are not eligible for the alternate tests to be assessed based on instructional level rather than chronological age. 7. Offer smarter testing options for English language learners. Advocate for a federal ESEA waiver from USED to allow English language learners to be assessed via the language acquisition test (NYSESLAT) rather than the English language arts exam for their first two years. 8. Develop Native Language Arts assessments for Spanish-speaking ELLs. Advocate for the Governor and state legislature to adopt the Board of Regents state budget priority request for $10 million in new funding to develop Native Language Arts assessments to provide districts the option of offering this assessment when it would best measure the progress of Spanish-speaking ELLs. 9. Clarify what new grades 3-8 test scores mean for students. Because student Performance on the 2013 grades 3-8 tests was based on more rigorous standards, and therefore proficiency rates cannot be compared to scores from previous years, provide clarification for what Performance Level 2 means when aligned with Common Core Regents exam performance levels. The new Level 2 on the grades 3-8 ELA and math tests aligns to “On Track for Regents Exam Passing for Graduation” on Common Core Regents Exams (until the required passing score is raised to the college and career ready level). 10. Focus extra support on students that need it the most. Extend the Academic Intervention Services “hold harmless” provision applied in 2012-13 to 2013-14 and 2014-15 to better ensure that existing support services for students remain relevant and appropriate as New York implements the Common Core. 1. Reduce unnecessary tests. Conduct expedited review of Annual Professional Performance Review (APPR) plan amendments where the changes reduce or eliminate unnecessary testing. 4. Offer flexibility to districts to further reduce local testing time required by APPR. Allow the use of school-wide measures for APPR purposes for teachers of middle school social studies (grades 6-8) and science (grades 6-7). 5. Prevent unfair negative consequences to teachers and principals. Provide that if a school district seeks to terminate an educator based on an ineffective rating resulting from student performance on Common Core assessments administered in the 2012-13 and/or 2013-14 school years, he or she may raise as a defense an alleged failure by the board of education to timely implement the Common Core by providing adequate professional development, guidance on curriculum, or other necessary supports to the educator during those school years. 6. Provide new curricular resources for teachers of students with disabilities and English language learners. Develop additional companion materials to the modules focused on differentiated instructional practices and supports that may be utilized to meet the individual needs of students with disabilities and English language learners. 7. Create a “Teacher Portal.” Develop an online tool to allow educators from around the state to share curricular resources, including adaptations of modules. 8. Ensure IEPs are appropriate to student needs as Common Core is implemented. Issue guidelines for Committees on Special Education to ensure that Individualized Education Program (IEP) recommendations address key challenges related to a student’s disability and his or her ability to master the Common Core Learning Standards and provide resources and tools to guide lesson planning for teachers to ensure that they have considered and addressed the unique learning needs of students with disabilities in their delivery of instruction. 9. Provide new resources to parents of students with disabilities. Continue collaboration with the Commissioner’s Advisory Panel for Special Education and Special Education Parent Centers to develop a set of guiding questions for parents to use in IEP meetings and to ask teachers about how their children are being supported to progress in curricula that reflect the Common Core. Author is Fascinating: No, the title is not about me. I wish. Last week our middle and high school students had a chance to meet and interact with Ben Mikaelson, the author of the book "Petey". This novel was the basis for the community reading book project led by high school English teacher, Keith Newvine. Mr. Mikaelson also held a community meet and greet on Friday night at Camillus Middle School. I was trying to get to that event, as well as the boys home senior night hockey game, and the high school musical all within the same three hours on Friday. 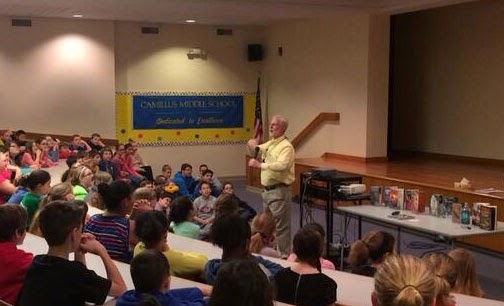 So I rolled into Camillus Middle School expecting to listen for a few minutes and then hit the road. Ben had SO many cool stories and experiences from his life that I found myself locked into the conversation along with a healthy group of parents who were also there. We were truly fortunate to have Ben come to town, and I am hoping that we might be able to get him again sometime. 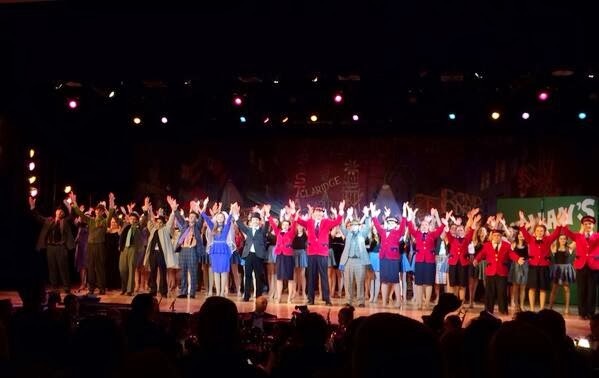 The Musical is Impressive: Back in the car and on to the high school I went for Guys and Dolls. The sets and costumes for the show were very memorable. I was also impressed with the acting and singing especially considering all of the snow days we used that took away precious practice time. The senior talent will be missed, but I feel special that I have had the opportunity to watch them perform on our stage. Thank you to all who made the show happen and congratulations on a job well done! Senior Hockey Players are Honored: Back in the car again and off to the boys hockey game. "Senior night". What a fine group of young men who had another win to cap off a perfect regular season. Well supported by our community as well. It is common to see students from kindergarten right through adults at the games, and I am really happy that they are such good role models. Congratulations on a great regular season. Girls Hockey is Epic: On Saturday an epic girls hockey game took place up north for the NYS Championship. 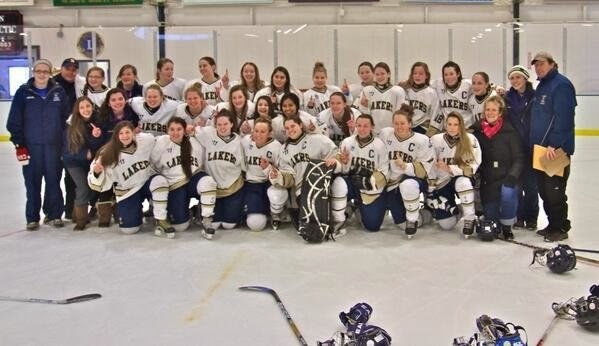 If you follow me on twitter, you saw about two dozen tweets about the Skaneateles Girls Hockey team. You should know and be proud that eleven of our lady wildcats are on this combined team, as well as some girls from other surrounding schools. Our students played key roles in the success of the team. The girls played Potsdam to a 2-2 tie through regulation. 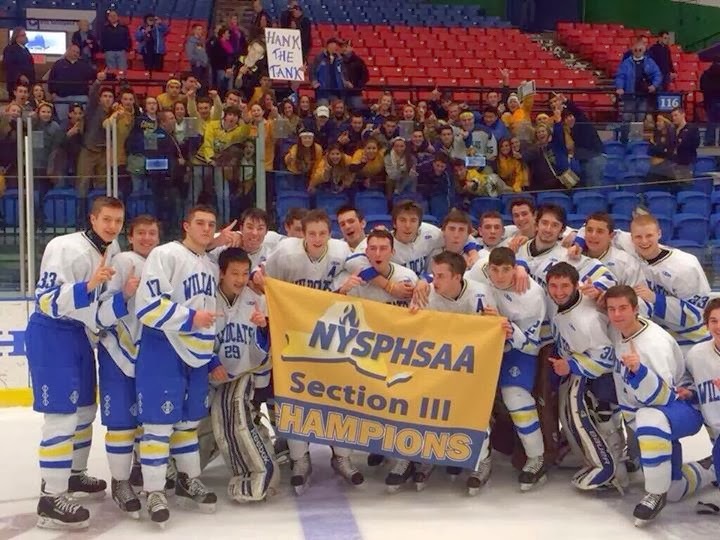 Four overtimes later, the score was still tied and by rule that awarded both teams as co-New York State Champions. Good stuff! There is no reason to think that they won't be back in the championship game next year! Congratulations! Strategic Planning Fires us Up: I am glad that the weekend was so eventful because I was still fired up, in a positive way, from the Strategic Planning session we had held on Thursday. This process is very powerful and produces the guiding document that the District uses for the upcoming school year. I would like to thank the parents, students, teachers, administrators, and Board of Education members who participated. We will place our updated strategic plan and focus areas on our website as soon as it is formatted and updated. Talking Prom Already: If you wonder why your neighbor's garage door has balloons on it, a car in a parking lot has "post-it" notes all over it with the word "Prom?" written in, or your local store is suddenly short on flowers, construction paper and tape, do not be alarmed; it is the start of prom season. I don't know if there is an "asking someone to the prom" Pinterest page, but I can tell you that students have gotten much more creative in the past couple of years! I know that there is still a lot of snow and cold out there, but winter sport sectionals start at the end of this week and spring sport sign-ups are underway. This is a good sign! What a weekend! A great Syracuse basketball game (if you are a SU fan, of course), and a Super Bowl game that was a lot less stressful to watch but just as enjoyable. Also, I ran into a bunch of past graduates while out and about and it made me feel old when they were talking about starting families, work, etc. Students Spell at the Bee: This weekend the Post Standard/WCNY Spelling Bee was held, and we were very proud to have Carter Leonard (CMS sixth grader), Collin Puchta (CMS eighth grader), and Abigail Ray (East Hill fifth grader) participated from our Wildcat family. Alaina Kenny from Onondaga Hill Middle School in the Westhill School District went on to win. Congratulations to all who participated. 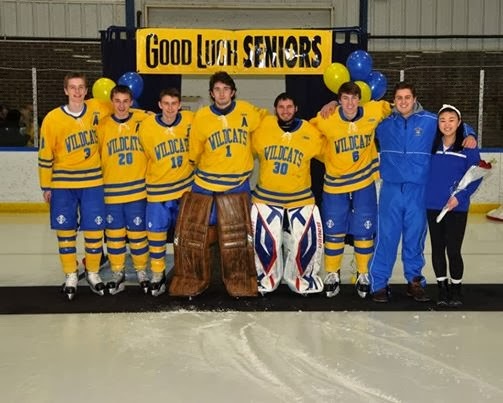 Wildcats Clinch League Title: On Friday the Wildcat hockey team clinched the League Championship for the seventh time in seven years. Once again we have a great group of young men who are making names for themselves both on and off the ice and I am looking forward to watching them as we near the post season. Practicing Emergency Preparedness: Also on Friday the administrators took part in an active shooter training at Stonehedge Elementary School. Emergency officials from the Camillus Police Department, Fairmount Fire Department, Camillus Fire Department, Fairmount Ambulance, WAVES Ambulance, and about a dozen student volunteers helped us to witness what an active shooter situation could look and sound like within a school building. Police used blank rounds and tracer rounds to demonstrate the noise of firearms in closed buildings and the student volunteers provided the chaos and yelling associated with such an event. It was sobering to say the least and the exercise is helping us to make some changes to our safety plans. I would like to thank all who were involved in this very important exercise and I hope we never have to deal with the real thing. What is GEA and How does it Affect our Schools: With all of the swirling around education about the common core learning standards, testing, and data collection, it is important to note that there is one thing out there that will hurt both sides of the argument; and most importantly our children. I do not reach out for your assistance that often, but I am very concerned about the governor's budget that was released a couple of weeks ago. State school budgets have had a line item in them for a few years now called the Gap Elimination Adjustment, or GEA for short. The GEA was enacted by former governor Patterson to help close the New York State budget gap. You might remember about four years ago when we had to lay off about 18% of our workforce. That was due to the GEA, increases in pension costs, and increases to health insurance. Governor Cuomo indicated that New York State is approaching a $2B surplus. In his proposed budget he called for an increase in money to schools. When you read the fine print however, very few schools except for those in extreme poverty or schools that are underperforming will qualify for the additional money that he is making available. This leaves West Genesee with about a $1.7M budget gap as we fine tune our expenses for next year. Obviously this will lead to significant reductions once again to balance the budget unless something is done. Rally for Change: Here is where you can help. 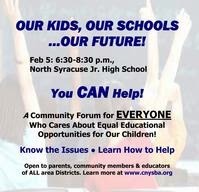 On February 5 from 6:30 p.m.-8:30 p.m. at North Syracuse Junior High School ALL are invited to attend a rally of sorts organized by the Central New York School Boards Association to help educated everyone on how to lobby our elected officials to reduce the GEA. This event was going to be used to discuss concerns about curriculum, etc. but the GEA impact is so large for all districts that the other concerns need to be put aside. A link to the flyer can be found here. As far as I know there are no assigned seats or anything else you need to do except show up to listen. All elected officials have been invited, but they will not speak. A full auditorium of area community members and school officials will send a strong message. If you can find the time to attend or help, it will be very much appreciated. In the coming weeks I will also provide a template letter that you can send to our elected officials. Let's keep our fingers crossed that the governor will allow money that he has already set aside to be used for the GEA instead. This will help ALL schools and not increase what he has already pledged. Planning Strategically: This week is our strategic planning meeting. Our strategic plan is the most important document that guides us to determine resources, needs, and direction. The strategic planning committee consists of Board members, administrators, support staff, teachers, and students. Be on the lookout for our 2014-15 goals. 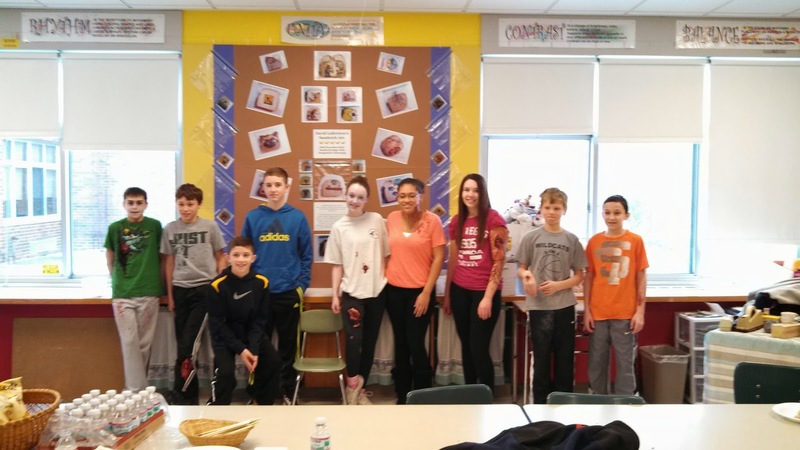 Author of Petey to Speak at CMS: We invite you to join us this coming Friday, February 7 at 7:00 p.m. at Camillus Middle School for the event: Finding the Heart of the Story. Ben Mickalesen,the author of the book Petey, will discuss the challenges he faced in creating his books and provides an in-depth view inside his research as he tries to uncover the "soul of a story". 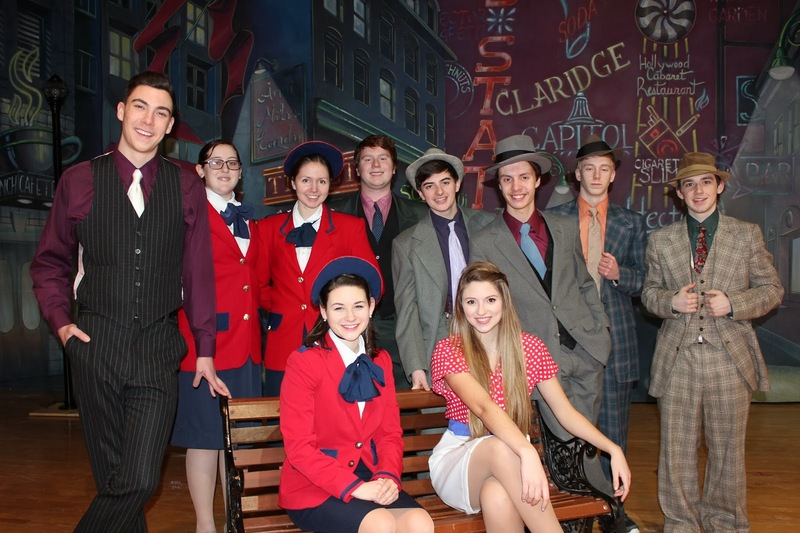 Guys and Dolls at the High School: The musical Guys and Dolls kicks off this week at the high school auditorium on Thursday and Friday at 7:00 p.m. and on Saturday at 2:00 p.m. I am very excited to see another top notch performance by our students!